Asterisk has a wealth of features to help you customize your PBX to fill very specific business needs. 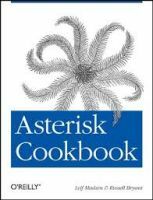 This short cookbook offers recipes for tackling dialplan fundamentals, making and controlling calls, and monitoring channels in your PBX environment. Each recipe includes a simple code solution you can put to work immediately, along with a detailed discussion that offers insight into why and how the recipe works.